By adding college to the name of their schools, four Southwest Florida technical centers have taken an important step in increasing awareness of their post-secondary certification programs and the opportunity for residents to advance to a well-paying career in as little as a year. Now known as technical colleges, the name changes at the Lee and Collier County schools are expected to reframe student and public perception and entice more students to consider certification programs to meet the regional workforce’s demand for skilled labor. So far 28 of Florida’s 47 technical institutes and centers have changed their names to college, including Fort Myers Tech and Cape Coral Technical College in Lee County, and Lorenzo Walker Technical College and Immokalee Technical College in Collier County. Deelynn Bennett, director of Charlotte County Technical Center, expects to pursue a name change in the future, an act that requires the approval of the school board. “Right now we’re making changes so we are aligned and articulating credits into state colleges,” she said. “We have to make sure there’s a fluid path built within all our programs, then have a discussion with our new superintendent. It’s something I’d like to see happen. Technical college education provides fast-track certification to jobs, preparing students for careers with intense one- to two-year programs. Tuition is a fraction of two- or four-year colleges and free to high-school students in the school district. Increasing the number of Southwest Florida residents with certifications is the goal of the FutureMakers Coalition, which is tasked with improving the post-secondary attainment rate of college degrees and certifications from 27 percent to 40 percent by 2025. Program graduates at McCormick’s school earned a median $38,000 in 2011, the highest among the state’ technical schools, and $10,000 more than a community or state college graduate, he said. In fact, Fort Myers Tech can’t produce enough certificate holders to meet demand in some areas of the workforce. Shannon Rousey walked away from a high-stress job in the automotive sales industry to enroll in FMTC’s major appliance and refrigeration repair program. His GI Bill paid for his education and provided a paycheck while attending the program. Upon earning his certification in 2013, Rousey started his own company Appliance Medic. His wife left nursing to help him run the business. Like Rousey, 80 percent of technical college certification holders in Southwest Florida start their own small businesses, the backbone of a local economy. The US Bureau of Labor Statistics projects faster than average growth in a number of skilled labor categories through 2020: medical assistants, licensed practical nurses, pharmacy techs, information services and support services. Some of the 33 certificate programs it identified offer salaries as high as $80,000. Technical colleges provide intense training for a variety of career certifications – from cosmetology and construction, aerospace and information technology to practical nursing and digital design. Nationally popular programs include healthcare, personal and culinary services, mechanic and repair technologies, and computer and information sciences. 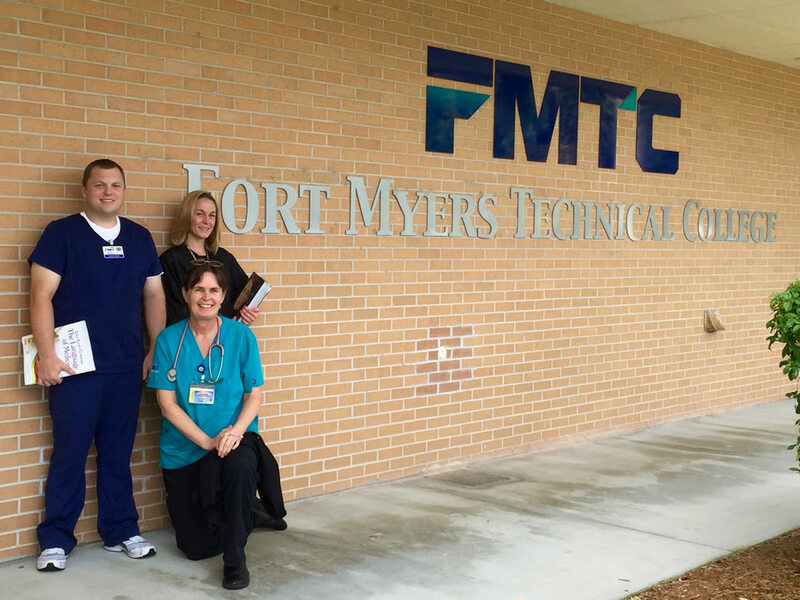 When she graduates this November from FMTC’s practical nursing program, 54-year-old Elizabeth Stork of Fort Myers expects to earn twice as much as she did working in a restaurant kitchen. A Pell Grant covered the tuition of the yearlong program. Married with a 7-year-old child, Stork said the coursework has been grueling, and clinical assignments – actual hands-on training – have included working at local hospitals. She’s currently the top student in her class of 11. Stork’s coursework at the technical college will also articulate to college credit at Florida SouthWestern State College or other state-run colleges should she pursue registered nursing. She can find gainful employment as a licensed practical nurse while enrolled in courses for the advanced training. At Charlotte Tech, about 185 students are non-traditional, adults who have returned to school to earn credentials and certificates in auto mechanics, HVAC, construction and nursing – among the school’s most popular offerings. “We’re above the state average for adult completion,” said Bennett. With the name change, McCormick believes more students will consider technical college to attain post-secondary training. Formed in 2015 around existing regional collaborations, the FutureMakers Coalition’s goal is to increase the number of college degrees and post-secondary certifications from 27 to 40 percent by 2025 throughout Charlotte, Collier, Glades, Hendry and Lee counties and promoting economic prosperity with a career-ready workforce. As one of Lumina Foundation’s 75 national Community Partners in Attainment, the FutureMakers Coalition is a diverse regional partnership involving education, government, business, nonprofit and citizen stakeholders and advocates formed with a cradle-to-career concept to ensure success for traditional students and adult learners. The Coalition is divided into Regional Action Teams that co-create solutions together, collectively providing a framework of support focusing on four main areas to increase completion: aspiration and preparation; access and entry; persistence and progress; and completion. The Southwest Florida Community Foundation serves as the anchor organization for the Lumina charter. The FutureMakers Coalition encourages residents to join and support this community-changing initiative. For more information, visit www.FutureMakersCoalition.com, call 239-274-5900 or email Tessa LeSage at [email protected]. Huh? Schools Think Kids Don’t Want To Learn Computer ScienceWhat’s behind the Deep South’s low high school graduation rates?